Light pink, paeony form flowers, sometimes with deeper pink veining, and white, picotee-edged petals. Dense, upright habit. Flowers February to April. Excellent looking plants, and a very good size. Delivery and packaging was also excellent. My shrub arrived expertly packed and in lovely condition. It was so well packed it took me 15 minutes to unpack it - LOL. 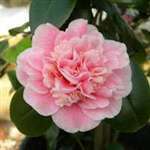 I am delighted with the quality of the shrub and will certainly buy again from this nursery.